One of the best way to meet spend requirements on credit cards is to use Amazon Payments. If this is this the first time you have heard of this, then you are in the right place. Without going into intricate details, I will do a simple summary of how it works. The basic premise is this: you send money to another person, and charge it to your credit card. 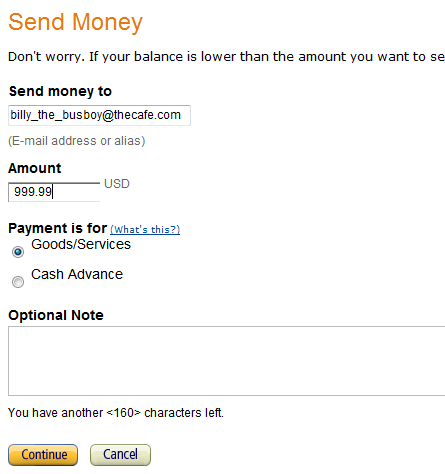 Almost all credit cards show this as a purchase from Amazon, and not a cash advance….so you are safe. The maximum amount per calendar month is $1000 charged to your credit card, and the maximum amount you can receive is $1000. The steps are pretty simple…..
1. Sign up for an account at payments.amazon.com Click on create account. 2. Link your bank checking/savings account and link a credit card to your account. 3. Then click on the SEND tab and fill out the fields. I usually send $999.99 to stay below the radar. 4. Select the radio button ‘Send Payment Using a Credit Card’ and select your credit card from drop-down….click Continue….click Confirm…….DONE! Q: Will I get charged fees like PayPal? Answer: No, there are no fees associated with a personal account. Q: Can I have multiple accounts? Answer: You can, but make sure you don’t use the same bank accounts or cards or addresses on the different accounts. If you have other questions, please email me or comment and I will gladly answer them.